Apparently, I didn’t know what I was talking about. As it turns out, all of the really impressive research on vitamin K has just come out in the last couple of years, and my reference books were older than that. Now, with all the new research finally in front of me, all I can say is this: Vitamin K might very well be the single best tool we have to combat osteoporosis. (Just don’t get too excited about vitamin K and forget the other tools! Calcium, magnesium, vitamin D, boron, zinc, silica, exercise, diet, sunlight, and even prescription drugs all have their roles to play, too). The first thing to realize is that vitamin K comes in more than one form. K1 (phylloquinone) is the form found in green vegetables and most supplements. But although K1 has a role to play in the body, it’s actually K2 (menaquinone) which is by far the most important for bone health. Unfortunately, K2 is hard to come by. There are bacteria in your gut which produce it, but they live so far down the digestive tract that what they make is hardly absorbed. Your body makes K2 itself (from K1, actually), but it can only make so much, and this amount decreases as we get older. And finally, some foods contain K2. The richest sources in the Western diet are butter, goose liver paté, and certain fatty cheeses such as Emmentaler. But the amounts are almost negligible. There is one food which is a significant source of K2: the Japanese fermented condiment, natto, which may contain up to 100 times the K2 found in Western food sources. 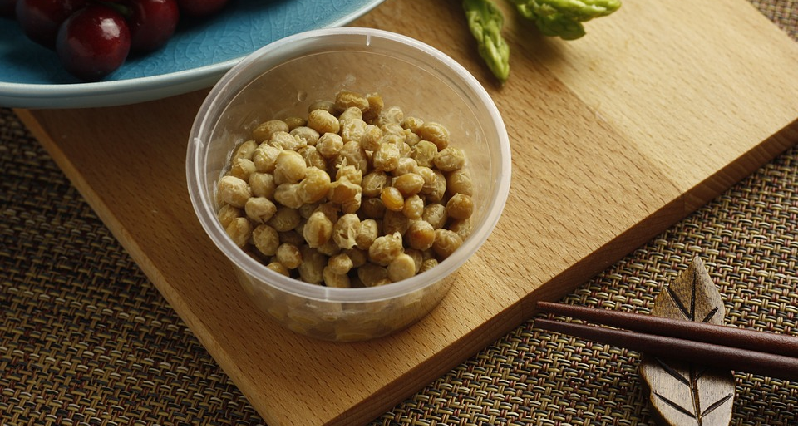 Natto is traditionally made from soybeans, fermented with the bacterium, Bacillus natto. It’s this bacterium – not the soy – which produces K2. Natto is “an acquired taste,” which is a polite way of saying that most people don’t like it. And even if you do like it, you’d have to eat more than seven quarts to reach the 45 mg of K2 used in most trials. The bottom line is: if you want a clinical dose of K2, you’re going to have to look to supplements . So what does any of this have to do with bone health? Well, we see that people with osteoporosis tend to have lower levels of K2 in their bloodstreams. We see a number of studies which correlate lifetime or regional natto consumption with lower rates of osteoporosis. We see test tube studies which strongly suggest that K2 supports healthy bone formation in a number of ways. And we see animal studies where K2 prevents and reverses bone loss under a wide variety of experimental conditions. But since I only have two pages, I’m going to skip over all of that and go straight to the human, clinical trials. For example, one study involving 241 people with osteoporosis compared 45 mg of K2 with a placebo. At the end of two years, the people receiving the K2 had lost 0.5% of their lumbar (lower spine) bone mass versus 3.3% for those on the placebo. Another study involved 80 osteoporotic women, and evaluated metacarpal (finger) bone density. This trial lasted only 24 weeks, but used 90 mg of K2, twice the standard dose. At the end of the trial, the women on the placebo had lost a surprising 7.3% of their bone density. The ones on the K2 gained 2.2%. Yet another study followed 83 women, who received either 800 mg calcium, or the calcium plus 45 mg of K2. At the end of six months, there was no change in bone density of the hip in either group. However, lumbar bone density increased 0.6% in the vitamin K2 group. Furthermore, the rate of bone breakdown in the K2 plus calcium group was 65% lower than in the group just receiving calcium! While these studies – and many more – have been able to demonstrate the effectiveness of K2 supplements, they nevertheless fail to answer one important question: how would K2 compare to conventional osteoporosis drugs? A recent trial attempted to answer that question . 72 post-menopausal women were given either 45 mg of K2, a calcium supplement, or a standard dose of the drug etidronate. (Etidronate, or “Didrocal,” is a biphosphonate drug, a close relative of alendronate, or “Fosamax”) . Etidronate was the clear winner with an increase in greater bone mass. But wait – here’s where things get really interesting. Despite this significant difference in bone mass between etidronate and K2, both groups showed an identical reduction in fracture risk – a reduction of roughly two-thirds versus similar women not on medication! (The calcium group, on the other hand, did not reduce their fracture risk). In other words, the etidronate looked better in a clinical, laboratory setting, but showed no advantage over K2 in the real world. Was this mere coincidence? Or is there something special about the way K2 supports bone health? What’s important to understand here is that bones are more than just dead calcium; they are dynamic, living tissue which is constantly being “remodeled” – that is, simultaneously broken down and built back up. It’s this constant remodeling, this refreshing of living bone tissue which keeps your bones young and resilient; not old, stale, brittle, and susceptible to fracture. Bone density screenings don’t measure resilience. They measure quantity, but not necessarily quality, of bone. Don’t get me wrong: bone density screenings are important, as a rapidly decreasing bone density is often your first sign that you’re in trouble. But medications which simply increase bone density (quantity) without addressing bone structure (quality) are stopgaps at best. Biphosphonates decrease the breakdown of old bone tissue without increasing the production of new, young, healthy bone. Thus, although bone mass can increase on the drugs, more and more of that bone will be old, stale, and brittle. I’m not putting down bisphosphonates. They significantly decrease fracture rates, at least when your bones have already begun to degrade. After all, when your bones are weak, anything that builds them back up helps. But when your bones are relatively healthy, biphosphonates appear to do very little. As the Journal of the American Medical Association editorialized in 1998, “the antifracture benefit of biphosphonates in women with low bone mass but without prevalent fracture must be judged to be small” (emphasis added). K2 is a different story. Numerous test tube and animal studies show that K2 not only decreases bone breakdown, especially under stressful conditions, but also promotes the formation of new, healthy bone. And on top of that, animal models of menopause show that K2 greatly improves bone connectivity (“bone quality”). Vitamin K is necessary for healthy blood clotting. Understand, however, that it doesn’t make your blood clot. It’s simply there, if needed, and shouldn’t raise the risk of stroke in normal individuals. In fact, quite a few studies have examined blood clotting during high-dose vitamin K2 therapy, and have found no problems . However, people who choose to take anticoagulant “blood thinners” such as warfarin (“Coumadin”) which work by interfering with the activity of vitamin K are a different story. If you are on any of these medications, you should use vitamin K supplements only under the supervision of your doctor. It should be possible to adjust your anticoagulant medication to accommodate a higher vitamin K intake. 5 Iwamoto, J., et al. (2001). Effect of menatetrenone on bone mineral density and incidence of vertebral fractures in postmenopausal women with osteoporosis: a comparison with the effect of etidronate. J Orthoped Sci, 6, 487-492. 6 It must be noted that the newer generation biphosphonates, such as alendronate (“Fosamax”), do tend to outperform etidronate, although it isn’t entirely clear how much better they are. As of 2002, they hadn’t been compared head-to-head. 7 See, for example: Asakura, H., et al. (2001) Vitamin K administration to elderly patients with osteoporosis induces no hemostatic activation, even in those with suspected vitamin K deficiency. Osteoporosis International, 12, 996-1000; or: Ushiroyama T., et al. (2002). Effect of continuous combined therapy with vitamin K(2) and vitamin D(3) on bone mineral density and coagulofibrinolysis function in postmenopausal women. Maturitas, 41, 211-221.